The Vienna café culture is such an integral part of what it means to be Viennese that UNESCO put it on the intangible cultural heritage list for Austria. But what is it exactly that defines the Viennese coffee house experience? If life was a coffee house in Vienna, we’d get nothing done and be better for it. When you cross the threshold, listen closely to hear the tick of your watch slow to a standstill. Perhaps the one truly defining element, therefore, is the complete absence of any pressure to drink up or move on. You can sit there for hours having ordered a single coffee. And people do. It doesn’t matter that the place is full. It doesn’t matter that there are people queueing outside. The staff will leave you more or less in peace until you ask for another drink or the bill. The coffee houses even encourage this behaviour with another little tradition. Somewhere inside each one is a rack, table or stand covered in newspapers for you to borrow. It’s this leisurely approach to the day, this congeniality, that turned Vienna’s coffee houses into legendary meeting places for artists and actors, poets and politicians, writers, intellectuals and revolutionaries. Many of the world’s great names worked, relaxed, conversed, exchanged news, and debated in Vienna’s coffee houses. Beethoven, Klimt, Freud, and Trotsky, to name but a few. There is even the term “Kaffeehausliteratur” (Coffee House Literature) to describe the many works of literature written at those marbled tables, particularly in the early 20th century. These creative traditions find an echo even today, with many coffee houses hosting regular author readings or piano-led musical performances. Forget yoga, meditation, weekend retreats, and time management courses. If you really want to relax, all you need is a Viennese coffee house and your reading glasses. Each coffee house or café may have its own distinct style, but there are common factors that help define the indefinable. The floors are usually wooden, the ceilings likely tall, the walls often embellished with artwork. Traditionally, the waiting staff dress in white and black, the waiters commonly in a tuxedo, the waitresses in a white blouse. Until relatively recently, the job was the domain of what we might call Schrödinger’s waiter – delicately walking the line between arrogance and affability. You could never know if they were friendly or unfriendly without opening the box. Such staff are rarer these days. The clothes are the same, but the attitudes more modern – more friendly and open. But still they remain a study in paradoxes: unhurried, yet quick; unobtrusive yet always available…waiting tables as both a service and an art form. You may not even see a menu unless you ask for one. There will be coffee, as you’re no doubt shocked to learn. But coffee is not coffee. You might try a Wiener Melange or a Franziskaner. An Einspanner. A kleiner Brauner. Perhaps a Verlängerter. A glossary might be handy. Your coffee arrives on a serving tray, the porcelain cup perhaps carrying the mark of the house. And with it – always – a glass of water. Nobody really knows where the water tradition came from, though there are various theories. You always have water with your coffee now because, well, you always have water with your coffee. The coffee spoon sits on top of the water glass, upside down. This dates back to the days of the aristocracy, when you wanted your guests to see the hallmark on the spoon’s back that proved it was solid silver. Some coffee houses serve little in the way of food, while some have fully-fledged restaurant menus. All should have cakes and pastries of one sort or another – particularly apple strudel and usually a glass vitrine heaving with Sachertorte and similar. 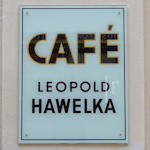 People always seem to be going into Café Hawelka, but none of them come out again. What does the Hawelka do with its guests?